NORWALK, Conn. (Jan. 7, 2019) – Attendees of the inaugural Racquet & Paddle Sports Show Preview, Jan. 23-25 and co-located with the PGA Merchandise Show in the Orange County Convention Center in Orlando, will be able to watch professional padel demonstrations, participate in on-court padel playing opportunities and learn more about the sport while exploring nearly 50 racquet and paddle sports brands and organizations on the event Show floor. 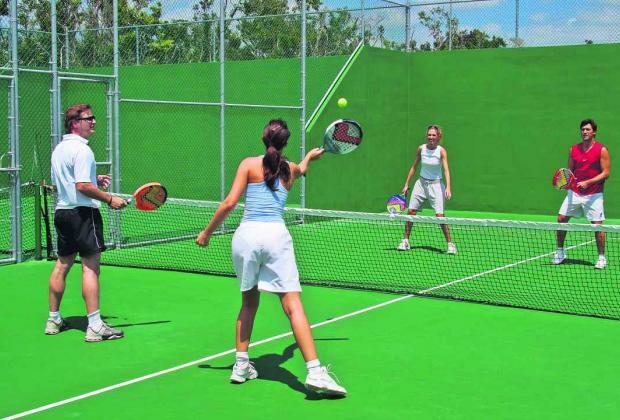 Padel is one of the fastest growing sports in the world with over 12 million players in 78 countries and 35 International Federations. Throughout the three-day Show Preview, attendees will be able to experience on-court games and skills hosted by Marcos del Pilar, the first USA Master Teaching Professional certified by All Racquet Sports/AFP Academy powered by adidas padel. Additionally, insights into building padel courts and the potential return on investment from adding padel courts to U.S. clubs and facilities will be shared by leaders of the sport from All Racquet Sports (USA) and All For Padel (Spain). Attendees can demo padel racquets, accessories and padel balls, while clubs & facilities will have the opportunity to register their professionals for padel teaching certification to grow the sport on a grassroots level. 12 p.m. – 12:30 p.m.12:30 p.m. – 1:30 p.m.
View the full padel court schedule at: www.racquetshow2019.com/padel. The portable padel court presenting sponsor is All Racquet Sports USA and supporting sponsors are adidaspadel, All for Padel, Babolat and Play Padel USA. The Racquet & Paddle Sports Show Preview court was designed exclusively for the show by AFP Courts of Barcelona, who has manufactured over 700 courts in 30 countries. This is the first time a padel court has been constructed indoors at a convention center in the U.S. The padel court is one of two demonstration courts at the 2019 Racquet & Paddle Sports Show Preview with the additional court being a multi-racquet and paddle sports surface, NEXT-COURT by Mateflex. The 2019 Racquet & Paddle Sports Conference is a three-day, future-focused B2B event, Jan. 23-25, in Orlando, Fla., bringing together racquet sport professionals, industry leaders, established suppliers and emerging brands. The multi-faceted event includes a hands-on product demo experience and opening welcome party at the USTA National Campus in Lake Nona; and a curated ONE2ONE buying summit, Tennis Owners & Managers (TOM) Conference and a pavilion of racquet, paddle and tennis vendors and organizations at the Orange County Convention Center. The inaugural Racquet & Paddle Sports Conference is organized by the Tennis Industry Association (TIA) and Reed Exhibitions and co-located with the PGA Merchandise Show. For more information, visit RacquetPaddleSportsShow.com.